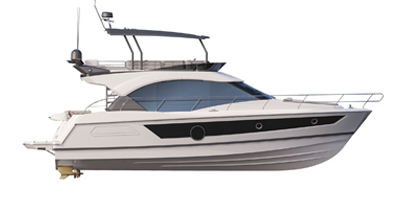 Further exploring the dayboat concept, the Gran Turismo 35 express cruiser was designed to maximize enjoyment topside, with generous living space in the cockpit and a huge swim platform, making it the ideal vessel for the outdoor lifestyle. The Gran Turismo 35's cockpit galley further enhances life on deck while the renowned Beneteau finishing touches guarantee indoor comfort. The Beneteau patented AirStep® hull design associated with Stern Drive propulsion offers a more comfortable and stable ride, better safety and superior performance.